This article examines one aspect of the current crisis enveloping the SWP. 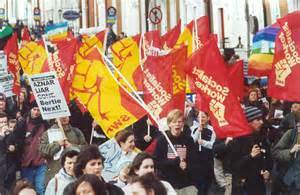 The SWP has not had a programme, so it has no real strategy for achieving the socialism it claims to support. Instead, the SWP leadership concentrates on the tactics it thinks will bring it new members. In the SWP leadership’s thinking, socialism will come about through an arithmetical increase in SWP members. Allan Armstrong, himself a former member of the SWP and its predecessor organisation, the International Socialists between 1972-82, looks into the history of the SWP’s lack of programme and strategy, and some of the results of its concentration on recruitment tactics. The SWP is currently undergoing a severe, and possibly a terminal crisis. The immediate causes of this crisis lie in the expulsion of four members for planning to meet to form a faction before the 2013 Party Conference; and the allegations of sexual assault directed against Central Committee (CC) member, ‘Comrade Delta’. As elsewhere in Britain, Scottish SWP members are divided between CC loyalists and dissidents. Just before this crisis exploded into the public arena, the SWP published a contribution to the Scottish independence referendum debate – Scotland – Yes to independence, No to nationalism. This pamphlet has been written the SWP’s Scottish organiser, Keir McKechnie. SWP organisers are appointed by the CC. So, there can be little doubt, where Keir’s allegiances lie in the current dispute in the SWP.